This folkore account details some of the signs associated with approaching weather systems. It is based on information supplied in 1938 by Edmond Burke (age 53) from Bunatober, Corrandulla, Co. Galway. A yellow ring around the moon at night is a sign of wet weather. The sun drowned in the clouds is a sign of wet weather. A red sky in the morning is a sign of rain and a red sky in the evening is a sign of fine weather. There is an old saying that:“The evening red and the morning grey are said to be the signs of a very fine day. If the stars twinkle frost is to be expected. There is another old saying that a rainbow in the morning is the shepherd’s warning and at night is the shepherd’s delight. If the hard, cold, biting wind blows from the east frost is to be expected. Crows lie in crowds in the field before a storm. Partridges and pheasants seek shelter in the hedges and bushes some days before a storm. The stable-fly is busy going about stinging horses and cows. Sometimes on a sunny afternoon the birds singing though sometimes a twitter from the trees. This shows that the birds are hiding themselves from the storm that will come in less than an hour. If the cat sits down and washes behind his ears a storm is surely coming. If there is a cabin near goats they go into it. The west wind and southwest wind usually bring rain. Before rain, horses stamp and if under a car rub their necks against the shaft. Sheep and goats that have been grazing on high ground come down to low ground. Ducks and geese and hens are busy picking themselves before rain. Cows lie chewing the cud for most of the day [before rain]. A cat scratching wood and a dog eating grass is a sign of rain. If a candle does not easily [burn] it is a sign of rain. If the soot falls down the chimney that is also a sign of rain. These Weather Signs form part of the Schools’ Folklore Collection, a large and important corpus of material, whose compilation occurred between 1937 and 1939. 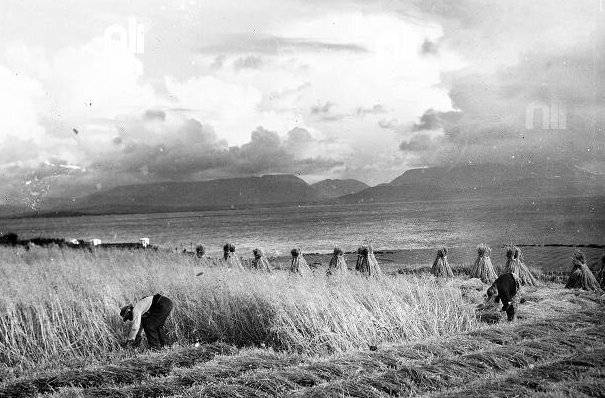 This far-sighted scheme, run by the Irish Folklore Commission, saw over 100,000 schoolchildren collecting local folklore from their parents, grandparents and older members of the community.